In peak seasons and busy periods, it's important to have a mobile computer with low power consumption to sustain long operating hours. 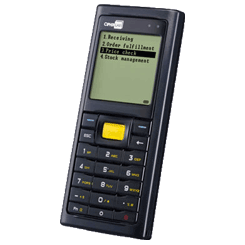 Ergonomically designed for shift-long comfort and compact enough to keep with you all day long, the 8200 mobile computer gives you reliable performance and continuous productivity shift after shift. The CipherLab 8200 features Long-lasting power performance for continuous productivity, runs on a rechargeable Li-ion battery, Choice of linear imager, laser, or 2D imager barcode scanning, Lightweight, ergonomic form factor that easily fits in your palm and your pocket, Supports a variety of C and BASIC programming, a CipherLab Application Generator that enables custom applications, and a MicroSD card slot with SDHC support.